Why did Hitler initiate the Final Solution and take Germany to war? Based on analysis of Hitler’s rhetoric—the words, images and metaphors contained within his writing and speeches—Koenigsberg’s study reveals the “hidden narratives” that were the source of genocide. Hitler’s actions—the history he created—followed as a consequence of his fantasy that by destroying the Jewish “disease” Germany might live forever. When political figures refer to national crises as ‘cancers,’ Richard Koenigsberg feels it’s no accident. He feels such expressions are echoes of a nation’s hidden belief systems. If you can understand the underlying fantasies that provide politicians with such rhetoric, then you can understand the country. This book presents an ingenious technique for identifying the psychological origins of political and social events. The best critical analysis in English of Hitler’s thought. An imaginative and important work. 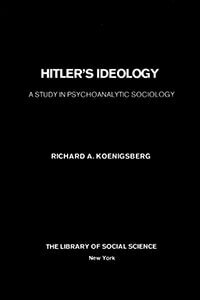 This exciting book provides deep insight into the relationship between components of the human psyche and social policy and endeavor, demonstrating that Hitler’s behavior followed as a consequence of his perception of reality. The amount of data Koenigsberg provides is overwhelming. Over five hundred citations are presented in which Hitler speaks of Germany as a living organism and as a national body afflicted with a disintegrating disease, and of the Jew as a deadly poison and a parasite. The implications of what Koenigsberg writes are far-reaching.